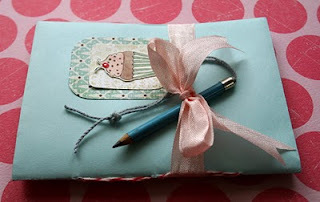 One of my favorite blogs, The Adventures of Blue Girl xo, has a really great tutorial for a cute little book. The cover is made with an envelope and is cut in such a way that you have little pockets in both the front and back, which I thought was pretty clever. Julie Collings is the blog's author and she posts a tutorial every Thursday and they are always great. Go here to see how to make the cupcake book but look around and you will find lots of inspiration. In the summer, when the temperature is just so, I instantly get a hankering for a good iced coffee. The operative word here is good! I like it smooth without the bitterness that a lot of iced coffees have. 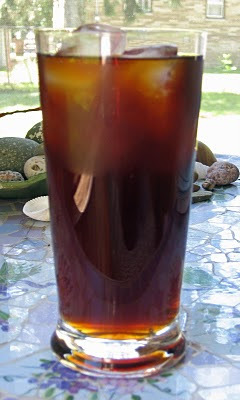 The bitterness comes from brewing the coffee with hot water, and here is the trick...you cold brew it. Of course, you should buy the best coffee you can and I am partial to fair trade, shade grown and organic. It is a little more expensive but well worth it. Also, this takes awhile to make so be patient! Here are my directions to make fabulous iced coffee. Mix the water and the coffee together and let it steep for 8 to 12 hours (overnight works well). Line a colander with a large coffee filter and drain into a bowl or container. (This part can be a little tricky finding just the right size colander and filter) It might take as long as an hour for it to drain completely but the wait is worth it. Now you have a coffee concentrate. Put the concentrate in a pitcher that holds one half gallon and add water to the half gallon mark. (You should have a total of about 8 cups) This will make about 4-12 ounce servings. I like mine with a touch of half and half. 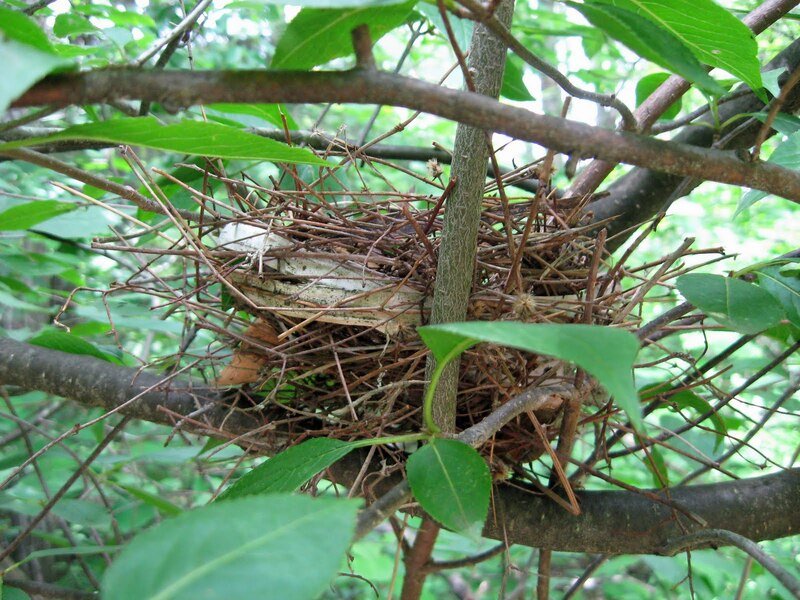 I've been doing a little blog-surfing lately and found some great blogs I thought I would share. I've added the links in this post, but also on the side column for future reference. Enjoy! Sara Lechler's blog is divided into three sections, art, fairies and art dolls and woollen creations. 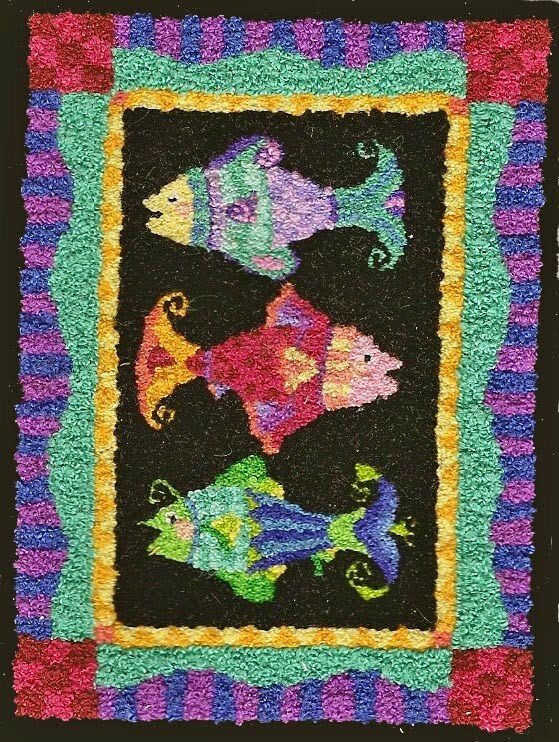 Sally Mavor, one of my favorite artist is the author of Felt Wee Folk and many children's book featuring her fabulous textile art. 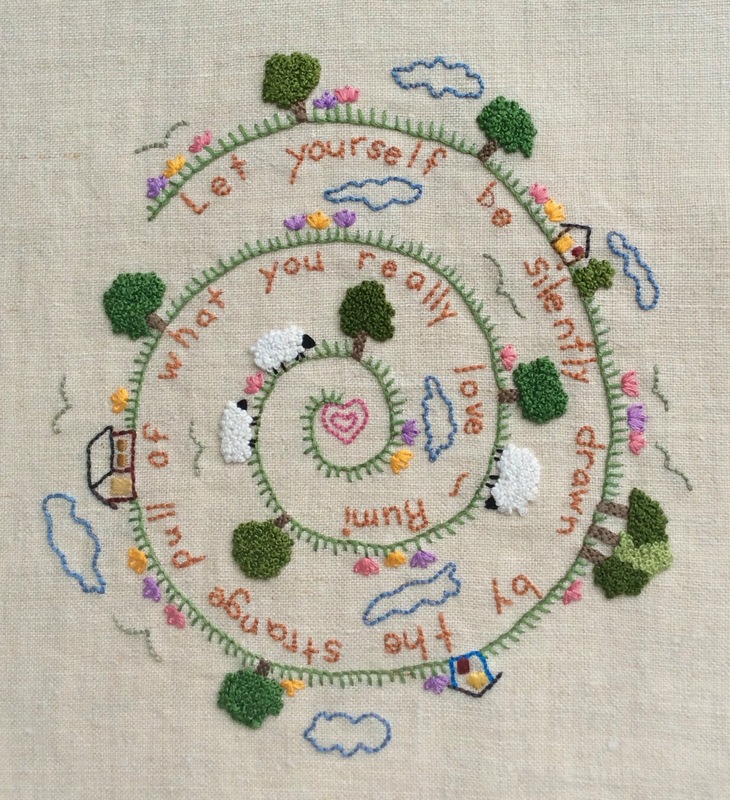 Embroidery as Art is Jenny Hart's blog. Jenny is the woman behind Sublime Stitching so you'll find great stuff with an edge here. Elsa Mora has some amazing paper cutting (her banner alone is worth the look), art dolls and illustrations. Doll, the Art and Craft of Mimi Kirchner is just what the title suggests. Mimi has a great sense of humor. 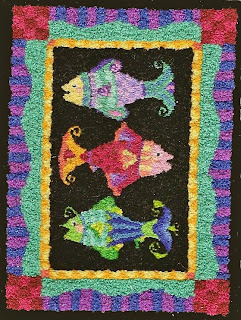 And lastly, Contemporary Embroidery focuses a lot on crazy quilt pieces filled with beautiful embroidery. The image at the top of this post is from this blog. Last night we enjoyed a true summer treat, berry yogurt parfaits. They were really simple to make, just take a large wine glass and put some sliced strawberries and blueberries in the bottom. Spoon about two tablespoons of plain yogurt on them, drizzle some honey on the yogurt and then some chopped walnuts. Add another layer of berries, yogurt, honey and nuts. Yummy! My husband was taking some spent peonies to the compost pile and saw me looking out the window. He stopped, raised them over his head and shook. 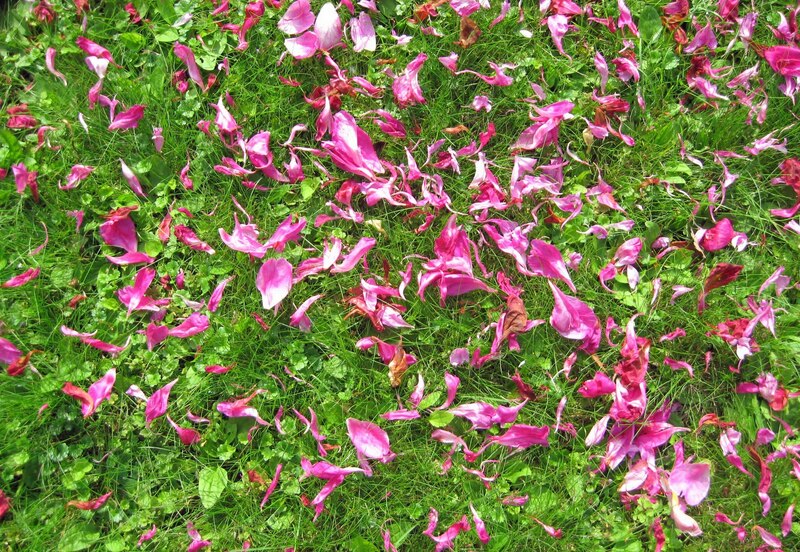 It was an amazing sight watching petals rain down on him. This is the way they looked all over the grass. 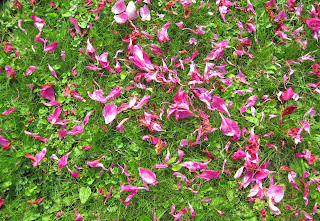 I love pink and green! This weekend we spent a lot of time on our bikes exploring the area. My favorite ride was through the new Stevens Point Sculpture Park. 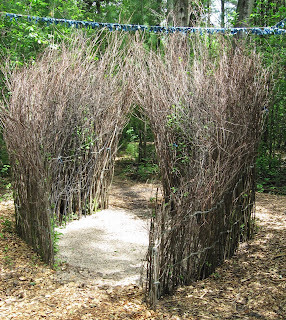 It is a lovely path through the woods and over creeks with sculpture nestled in the trees. 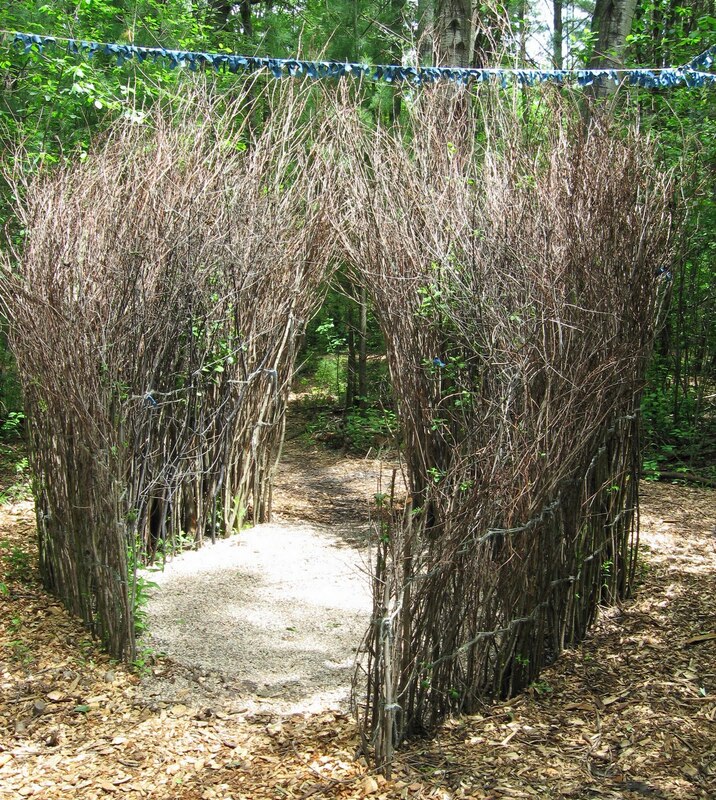 One of my favorite sculptures was a room-like space created with dried branches woven together. 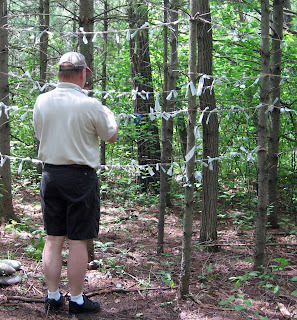 Another had cords tied to the trees and tied on to the cords were small pieces of paper. Each paper had a message or blessing written on it by hikers. Nearby was a jar with paper strips and pencils, so we added our blessings to the sculpture. 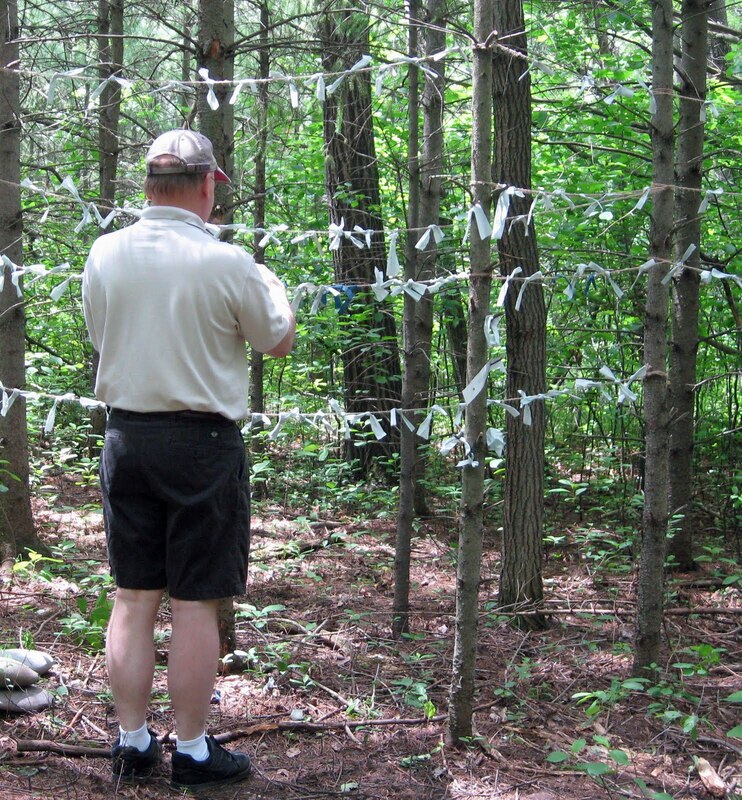 I believe this is similar to a Japanese tradition of tying papers with blessings onto trees. We also found a little bird nest. 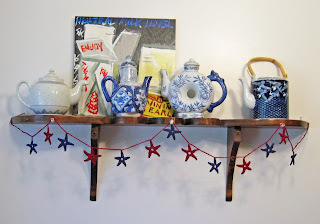 I've been working on a little Fourth of July project for you. 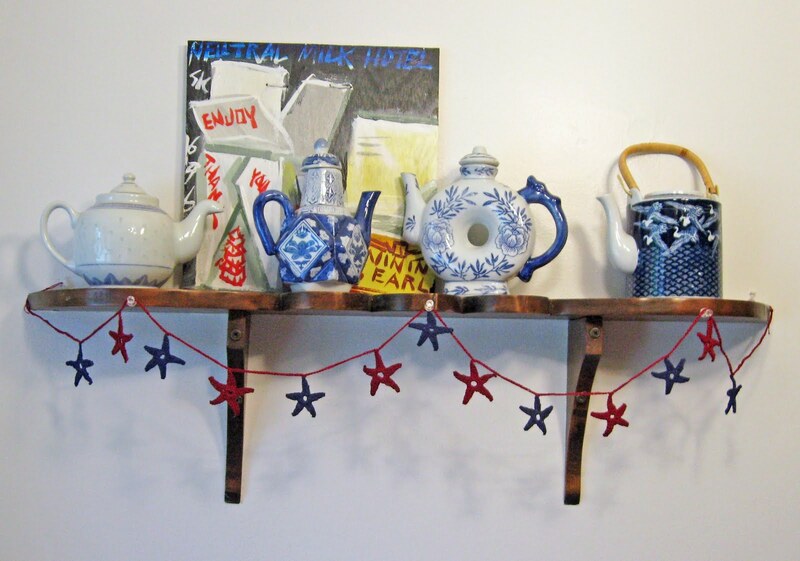 There are so many cute garlands around the bloggosphere that inspired me to try one out for myself. 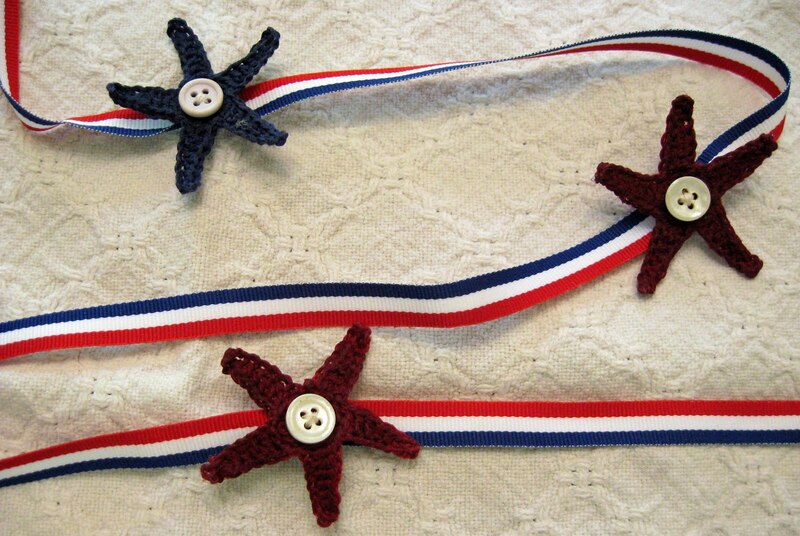 These stars are crocheted and then attached to a crochet chain, stiffened and voila you're ready for a celebration. I tried another version and sewed them onto a red, white and blue ribbon but they didn't hang right, so I've decided to use them to run down the middle of my table and I'll take some and tie them around some napkins for napkin rings. It will be very festive. 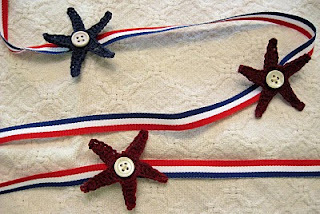 The great thing about them is they take no time at all to make and you can whip up one of these garlands, or at least all of the stars while you are watching your kids at soccer or during a T.V. show. If you are not a crocheter here is a link to some good directions, including a video! Here are the directions for the stars. Make 7ch, sl st into first ch forming a ring. 1st round 1 ch, work 15 sc into ring, sl st into first sc. 2nd round 9 ch, work 1 sc into 4th ch from hook, 1 hdc into each of next 2 ch, 1 dc into each of next 3 ch, skip first 3 sc on ring, sl st into next sc, *9 ch, work 1 sc into 4th ch from hook, 1 hdc into each of next 2ch, 1 dc into each of next 3 ch, skip next 2 sc on ring. sl st into next sc; repeat from *3 times more placing last sl st into same st as sl st of previous round. Fasten off. I made 13 stars (7 blue, 6 red). To attach to chain. With red make a chain about 4 inches long. sl st into the top of a blue star, ch another 3.5-4 inches, sl st into the top of a red star. Continue alternating red and blue stars finishing with a blue star and make a 4 inch chain beyond the last star. The stars will curl a bit so I used Stiffy and diluted it with the same amount of water. I painted it on both sides of the stars being careful not to get it on the chain and laid them out flat on wax paper to dry. 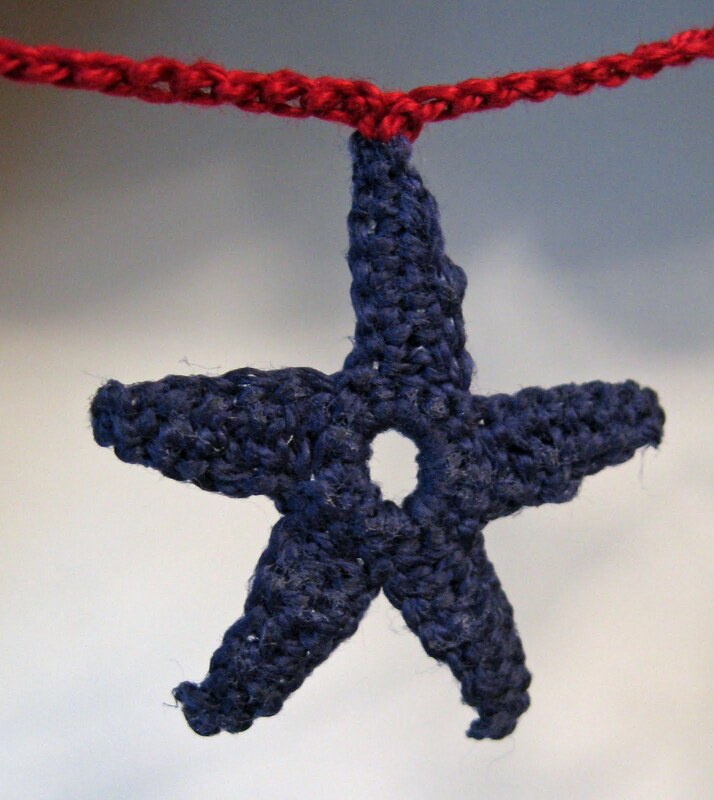 You can sew or glue a button in the middle of the star if you want. Now to get the picnic gear!!! !